On September 4, 2018 a Sullivan County resident responded to the Kingsport Justice Center to report that her debit card was being utilized to make fraudulent transactions. She recalled last using her card 4 days earlier on August 31st at the Subway restaurant inside Holston Valley Medical Center, so it was stolen either on or sometime after that date. Her stolen debit card was later utilized to make two fraudulent charges. 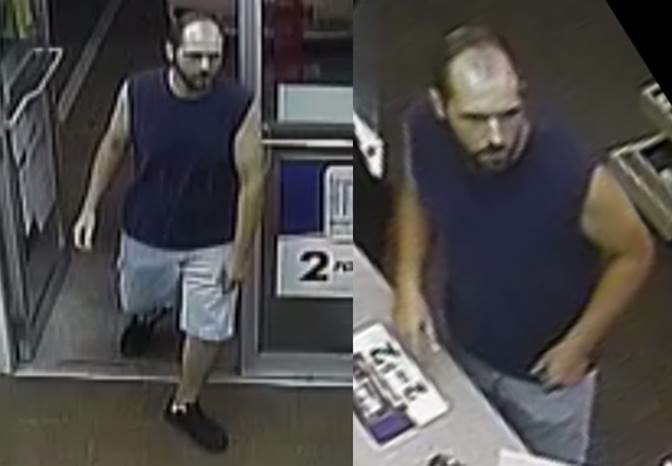 One of these occurred at Kroger, located at 1664 East Stone Drive, while the other occurred at Murphy’s Express, located at 3100 Fort Henry Drive. A third fraudulent charge was attempted at a local Walmart; however, that transaction was declined. K.P.D. Detectives were able to obtain surveillance video footage of a suspect during the transaction at Murphy’s Express. He appears to be a middle-aged white male adult with a receding hair line and a beard. Photographs taken from that footage have been included in this release.